LOS ANGELES - Jay Leno rolled up to a picket line on his motorcycle with doughnuts for striking writers at NBC. Julia Louis-Dreyfus marched with pickets at Warner Bros. in the shadow of a giant billboard advertising her CBS show, "The New Adventures of Old Christine." 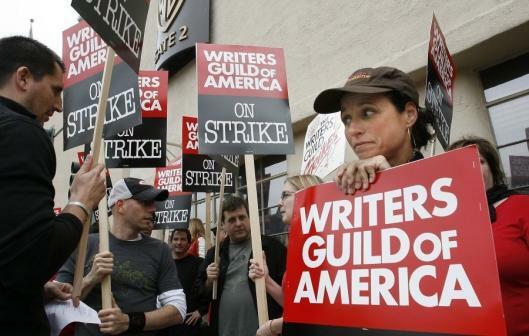 Some 12,000 screenwriters went on strike against the US film and television industry yesterday after the collapse of last-ditch contract negotiations aimed at preserving nearly 20 years of Hollywood labor peace. Popular late-night talk shows such as NBC's "The Tonight Show With Jay Leno" and CBS' "Late Show With David Letterman," which are produced on a day-to-day basis and depend on a steady supply of topical jokes and sketches, were expected to go into immediate reruns. Prime-time comedies such as the CBS hit "Two and a Half Men" and Kelsey Grammer's new Fox sitcom "Back to You" also are expected to be knocked out of production because they depend on substantial last-minute script rewrites. The striking writers got a little help from their famous friends. In Burbank, Louis-Dreyfus wore a cap, sunglasses and Screen Actors Guild T-shirt as she joined strikers chanting, "Hey, hey, pencils down. Hollywood's a union town." "How this is resolved will directly affect our union, too," she said, referring to the actors union contract that expires next year. In New York, Tina Fey of "30 Rock" joined strikers outside Rockefeller Center, the headquarters of NBC. Ellen DeGeneres wasn't spotted on the picket lines, but her publicist Kelly Bush said she took the day off in support of the writers on her daytime talk show. Noise and other disruptions caused by a picket line interfered with filming at a location being used for the CBS show "Cane." About 20 writers chanted, screamed, and used a bullhorn near the CBS lot in Studio City, causing the production to move back onto the nearby CBS lot. Tom Hogan, a location manager for the show, said filming began hours before the pickets arrived and involved a script that was finished several weeks ago. "But you know what? I support them," said Hogan, a member of Teamsters Local 399, which represents truck drivers, casting directors and location managers.